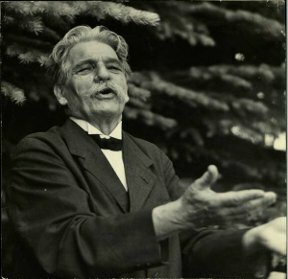 Today is Albert Schweitzer’s birthday (1875). He was a doctor, theologian, musician, philosopher, winner of the Nobel Peace Prize (1952), a great humanitarian… and, at least at some points in his life, a vegetarian. He built a hospital in Gabon, Africa, and worked there for many years. Schweitzer believed that all forms of life, not only human, are worthy of reverence. Ethical people try to preserve and nurture life as much as they can, according to Schweitzer. To injure or destroy life is evil, but sometimes unfortunately it’s necessary; so we must all be aware of our responsibility to minimize the harm that we cause to other living creatures.